Do you like crafts? If you are a serious crafty person who makes crafting one of the few priorities in life, you should know that organizing the small craft supplies and tools is very critical. Not even trying to organize them would lead to a chaotic craft room, where you'd spend hours and hours of looking where you put your blue thread or pink polkadot ribbon. That leads to ineffectiveness and wasted time, which means less money made. So it only makes sense to be always organized with your craft supplies. Check out our 10 creative ideas for craft storage below. Akrobins make organizing super easy. They're available in different colors and sizes, making it easy for you to color-code and decide which size of Akrobins fit the scissors and which fit the buttons and beads. 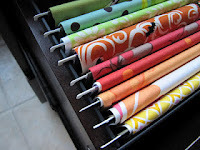 You can simply stack them on top of each other, or arrange them on a rack or in a cabinet to look and stay organized. Why not? 5 gallon pails are inexpensive. They are easy to get. They are big enough to hold rolls of craft paper and they are also available in many different colors. Easy identification makes easy finding; and therefore saves time. To keep the supplies from getting dusty, simply put a pail lid or an even better Gamma seal lid. Glass jars are perfect to store color pencils, paintbrushes, crayons, etc. They are also great to keep buttons as they allow us to see what's inside from the see-through walls. Yes, file storage. Karen from Sew Many Ways has this creative idea to store her fabric with file storage cabinet. For cheaper option, go with the kraft file storage boxes we have. Like glass jars, cans are great to store stationaries, including color pencils, scissors, rulers, etc. You can either buy one or decorate used cans for this storage. Don't throw away those cardboard shipping boxes you got. Use them to store craft supplies, scraps, or even the sketches and doodles you do for the next craft ideas. Label the box, and you're already giving it a second life and purpose. Wash them well and reuse them. Too many people use these cups and don't get them recycled at all. Using them as craft storage is a great idea to keep them away from the landfill. It's just perfect to store little things like beads and buttons. It also makes a great display for small jewelries such as earrings and rings. Used mailing tubes can be a great place to store your large print, painting or craft paper and even fabric. They also save so much space. Just stick a small cut of it on the outside wall of the tube for identification. The old laundry basket could also make a great craft storage. You can dump anything you like there: reference books, fabrics, ribbons, craft papers, etc. Storage ideas don't have to be expensive. Just have those in hand and make them attractive enough to be a display in your craft room but functional enough to store all the little bits of the craft supplies. This way you can concentrate only on your creative side, the thing you love doing the most, and worry less about the mess. Happy crafting! does this remind anyone else of cubbies back in like kindergarten? They are a really good storage device but I was just curious as to why we were using it for little kids but not for ourselves?